It’s a beautiful morning in Raleigh, NC to be driving to Jubala Coffee. The objective of this trip? 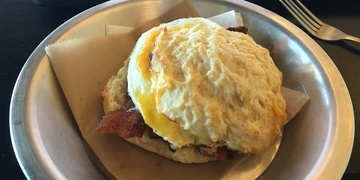 To enjoy one of their highly addictive sweet biscuits with maple bacon, cheddar cheese, & an over-medium egg with a hot cup of coffee. To make things even sweeter, Jubala composts their extra food waste.